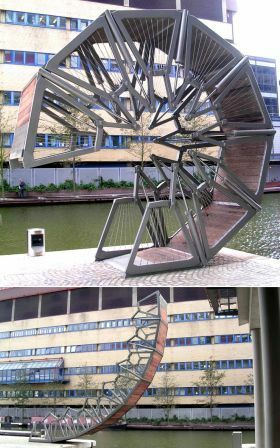 Thomas Heatherwick's award-winning rolling bridge (London) is an ingenious addition to the grand union canal system in London and is unique in its design. Unlike regular movable canal bridges, the rolling bridge curls up on itself to form an octagon by way of hydraulics. It's an amazing sight and a reminder that a fresh perspective can produce great, innovative results, even when dealing with a structure as common as a bridge.